Democrats have said they will try to impeach Donald Trump over claims he obstructed justice, saying "no president is above the law". The party claims President Trump obstructed an FBI investigation into Russian interference during the US election and says they will now file official articles of impeachment against him. The announcement comes as former FBI Director James Comey is scheduled to testify before the Senate Intelligence Committee. He is expected to be asked whether Trump pushed him to end a probe into a former national security adviser's contacts with Russia. Rumblings of a possible impeachment process began several weeks ago but it has taken officials until now to announce they will begin the formal process of filing the necessary articles to begin the proceedings. 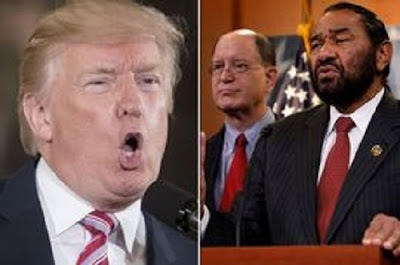 Announcing their intention to start the impeachment process, Democrat representative Al Green said: "The question really is not whether the president has obstructed justice. "The question really is whether the president can obstruct justice with impunity. The question is whether the House of Representatives will allow an obstruction of justice with impunity. "The president like all others, is not above the law. I have engaged in the process of drafting articles of impeachment my articles of impeachment are being reviewed and at some point if no one else does, I will file articles of impeachment to impeach President Donald J Trump. Democrat representative Brad Sherman added: "This is a difficult time for our country. We need governance that is competent and that respects the rule of law.